Last week, Scott shared his thoughts on how to manage the ewe flock during mid to late gestation. Join us this week as Scott provides some helpful tips to think about as many approach pre and post lambing here in Ohio. In general, start feeding 0.5 lb. of grain per head daily as a preventative for pregnancy disease. Grain may be in the form of whole shelled corn or barley. Even if ewes are on good quality pasture, they still require the extra grain. During the winter or when on poor quality pasture, feed approximately 4 lbs. of hay in addition to grain. Shear the wool from around the head, udder, and dock of pregnant ewes. If covered facilities are available, shear the ewes completely. 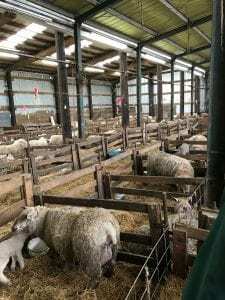 Sheared ewes are more apt to lamb inside, the inside of the barn stays drier because less moisture is carried in by the ewes, more ewes can be kept inside, and it creates a cleaner environment for the lambs and the shepherd. Sheared ewes must have access to a barn during cold, freezing rains, and they must receive additional feed during periods of extremely cold temperatures. Vaccinate ewes for overeating disease and tetanus (ex. CD&T). These vaccines provide passive immunity to baby lambs through the ewes’ colostrum until they can be vaccinated at 4-6 weeks of age. Check and separate all ewes that are developing udders or showing signs of lambing. Check and remove heavy ewes once a week during the lambing season. As a rule of thumb, one month prior to lambing, increase the grain on all ewes showing signs of lambing to 1 lb. daily, and feed all the good quality grass/legume hay they will clean up. Observe ewes closely. Ewes that are sluggish or hang back at feeding may be showing early signs of pregnancy disease. If so, these ewes should be drenched with 2 oz. of propylene glycol 3-4 times daily. Stock lambing supplies such as iodine, frozen colostrum, stomach tube, injectable selenium and Vitamin E, OB lube, lamb puller, ear tags, etc. Check ewes on a frequent basis (every 3-4 hours), as feasible. Typically, it is not necessary to check ewes in the middle of the night. 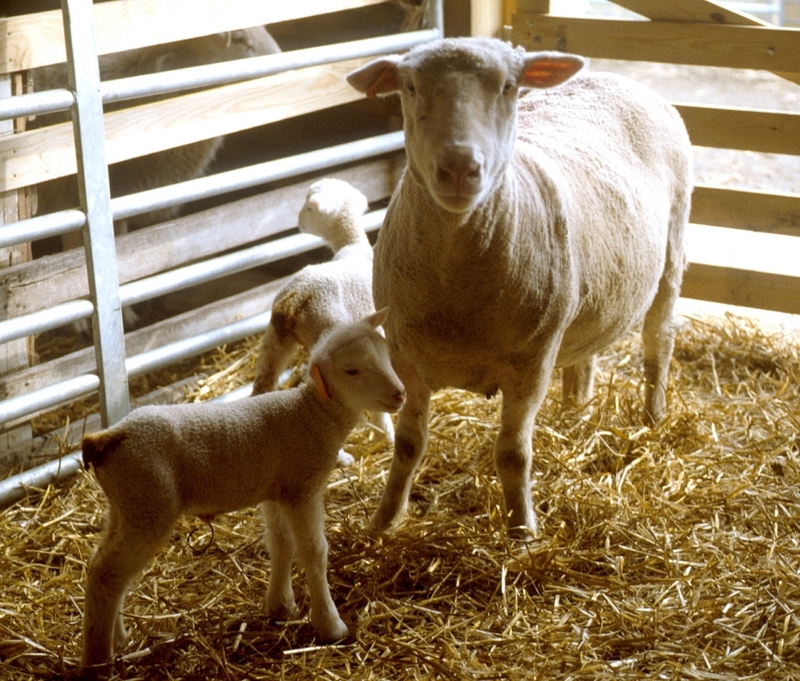 After lambs are born, move the ewe and her lambs to a lambing pen with a minimum dimension of 5′ X 5′. Check the ewe’s udder to see that she has milk, strip each teat to remove the waxy plug that may be present at the end of the teat, and make sure lambs nurse within 30 minutes. Colostrum is critical for baby lamb survival. For ewes without milk or for lambs that fail to nurse, lambs must be given colostrum via a stomach tube. If sheep colostrum is not available, cow or goat colostrum should be used. Colostrum should be thawed using indirect heat. Lambs should receive 20 ml (cc) of colostrum per pound of body weight. It works best if feedings can be 4 hours apart. Only use a heat lamp if lambs are weak and chilled. Avoid danger of fire by hanging heat lamps 3 ft. above the bedding and in the corner of the lambing pen. Block off the corner so that the ewe cannot get under the lamp. [However, I would seek an alternative to avoid the risk of fire danger]. If selenium deficiency has been a problem, lambs should be given an injection of 0.25 mg selenium per 10 lb of body weight immediately after birth. A good quality mineral provided to the ewe flock on a year-round basis has been shown to be the best way to prevent selenium deficiency. Ewes should receive fresh water and high quality hay the day of lambing.. One pound of grain plus 5 lbs. of good quality hay daily will take care of their needs until moving to a mixing pen. Move ewes and their lambs from lambing pens to mixing pens. Make sure lambs are matched up well with their mothers before moving to larger groups. Ewes with twins should be receiving 2 lbs. of a 15% crude protein grain mix and 5 lbs. of good quality hay daily. Ewes with singles should be receiving 1 lb. of a 15% crude protein grain mix and 5 lbs. of good quality hay daily. Lambs on a winter-lambing program should have access to a high-quality creep feed by the time they are 7 days old. Creep feeds should contain 18% to 20% crude protein and be low in fiber. Wean winter born lambs at 2-3 months of age and spring-born lambs at 3-5 months of age. Weaning age will vary depending on the marketing plan for the lambs. Generally, winter-born lambs should be weaned at an earlier age and managed to grow rapidly and be sold in the spring at a young age. Spring-born lambs should be weaned at an older age, derive a large percentage of their growth from forage and therefore grow at a slower rate, and be marketed in the late fall and winter at an older age compared to winter-born lambs. Posted by Braden Campbell at 8:00am November 13, 2018 Posted in Management and tagged Health, Management. Bookmark the permalink.